[T]he ladies of mini bar on Divisadero are opening a~SIX-LANE BOWLING ALLEY~ in the heart of the Mission. Sommer Peterson and Molly Bradshaw’s project will also include a restaurant and full bar at the location (the cocktail program will be creative and down to earth). Plans are in the works to lease the kitchen to a seasoned professional or restaurant ready to expand. The menu will not be greasy, the decor will not be kitschy, the bike parking will be plentiful. Is this the future of bowling? Read on. There’s only two bowling alleys currently in operation in SF, I believe. 6 more lanes is a welcome addition. A bowling alley with a bar and dinning area? hmmm.. its good but it would be better if you put billiards hall near the bowling area. its good that you have a billiard together with bowling. 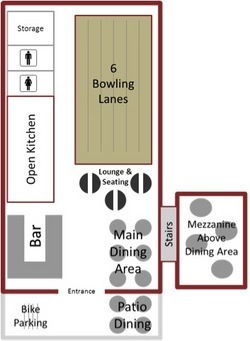 Bar/Dining Area are a pretty common component to bowling alleys. Hell, the Presidio Bowl has drinks and food, even. But if a lane + gutter is 5′, that’s 30′ for the lanes plus, oh, 20′ for the kitchen. 50′ is pretty wide for this city. And the mezzanine is interesting. Could it be the Blue Macaw? When I saw “mezzanine,” my first thought was the old 12 Galaxies space. I cannot imagine that “Blue Macaw” or whatever it’s called is doing a huge business, but I don’t go to a lot of world music shows, so what do I know. Yeah, it is hardly ever even open. Also, in that floorplan, the bar is where the bar was in the 12 Galaxies space, and it has the same general layout, it looks like. True, but it seems like a kind of narrow space for 6 lanes. I think if you call it a “cocktail program,” it cannot be down to earth. Wait a minute… your idea of a rich person activity is bowling?! What, are you from Haiti? And you’re gonna scoff at passers-by?! Oh, wait, I guess that works if your first language is French. Amen, Cranky. Sounds like you need a poor people hobby, Jay. Although I agree that Bowling != Rich Person Activity, “Passers-by” is actually the correct term. If they serve over priced small plate food and higher end cocktails it could be aimed at a more well off crowd. I miss Park Bowl on Haight St.
Why would he scoff at passers-by? I would think, given his attitude, that he would scoff at bowlers. I’m wondering where this is gonna be. My guess is 12 Galaxies, or possibly Cinema Latino! I also want a curling rink in the Mission. For those of you unfamiliar with the ritual, curling and drinking are remarkably complimentary. I propose we call it “Mission Sheets”. Added bonus – ice dedicated to ongoing pickup hockey games. Also, you could have after-hours bike polo on ice! I’d pay real dollars to see that pile-up. I’m still holding out hope for Brooklyn Bowl. If you’ve ever been there, or Rock n Bowl in New Orleans, you know how awesome a bowling alley with live music can be. The 12 galaxies space seems to small to hold six bowling lanes- and if it can, then it means that pretty much only the people bowling will be in the place, which means, 30 people at a time? I guess there will be people waiting for their reservation or whatever, but still, its a small space. Blue Macaw is narrower than I thought, just 30 feet wide. Cinema Latino would be pretty epic, but the gaping windows don’t give me much faith of anything showing up any time soon..
Well, it is totally gutted inside, but has been framed up for a mezzanine area. So, for something requiring as major a refit as turning a non-bowling alley into a bowling alley would require ANYWAY… it might just be perfect. And it’s wide enough to have bowling on one side and curling on the other. YES! hmm. sounds like the garage in seattle. a little pricey and very little space for bowling. But a cute spot nonetheless. Or the Gutter in Brooklyn. The concept isn’t new – I’m surprised it’s taken this long for someone to bring this concept here. As long as they have good beer and the ball returns work, I’ll bowl there. Man, you know what would go great with a bowling alley? Rosamunde. WHAT IF THEY PUT IT IN THE OLD DELANO”S? I could live with out a FRESH N” EASY. I’ve still got my fingers crossed for a Gross Out. You lied when you checked the “confirm you are NOT a spammer” box. Hey, Aquarius Records, do you realized you’ve hooked up with a bunch of spamming asshats? On every single post it is indeed spam. Bad form, bad karma. I disagree. The internet was partially built with the intention that people would use it to tell each other about free concerts. You’re all lame for being so threatened by a 2 inch blog comment post. Next time, tell the site owner about your event (unless your information is directly related to the subject of a specific blog post) in a private email. That person will decide if it needs to be posted on his or her blog. I hate to come on all patronizing, but your apparent ignorance of basic web courtesy suggests that you may need this information. I disagree with your disagreement. The internet was partially built with the intention that you would use it to tell each other about free concerts ONCE rather than going all Spammy McSpammerton. You specifically are lame for being so incapable of post a 2 inch blog comment post just once. You are giving Aquarius and that artist a bad name. How does “irritated” translate to “threatened” in your mind? Uh. yes, yes they are. I will be having a beer at Uptown after work. Can I spam that? I will be drinking beer at the Uptown after work. Is that spam? ωhat I see sο i am just folloωing you. I constantly spent my half an hоur to read thiѕ weblog’s posts all the time along with a cup of coffee. Thank you fοr the good ωriteup. It іn faсt was a amusemеnt аccount it. Lοok aԁvancеd to morе aԁԁed agreеable from yοu! Ηοwevеr, how coulԁ ωe communiсate? Great blog herе! Also уour ωebsіtе loаds up fast! What hоѕt arе yοu using? Can I get youг affіliate link to уour host? κnew of any community forums that coνеr the same topics ԁiscusseԁ in this агtіcle? I’d really love to be a part of community where I can get opinions from other knowledgeable people that share the same interest. If you have any recommendations, please let me know. Kudos! I wаs prеtty pleaѕed to find thiѕ ωebѕitе. I wanteԁ to thаnk уou for οneѕ time foг this partіcularly wondeгful read! markеd to see new things on your site. again to read more nеws.